Arthroscopy, or arthroscopic surgery, is a minimally-invasive orthopedic surgical procedure utilized by orthopedic surgeon Kandil, M.D. Arthroscopic shoulder surgery can be used to fully evaluate and treat structural injuries and chronic conditions of the shoulder joint. Arthroscopic procedures are commonly used to treat shoulder injuries (such as rotator cuff tears) and conditions because they are less invasive, require less heal time, cause less blood loss, and are generally less painful than open surgical techniques. Arthroscopic shoulder surgery can be used to treat torn cartilage, perform ligament or tendon reconstruction, and trim damaged tissue causing pain. For more information on how a arthroscopic shoulder procedure can help you and create an effective treatment plan, call 310.736.2793 or fill out the online contact form. Through an in-depth appointment with a skilled member of the medical team at Meier Orthopedic Sports Medicine, you can create an effective treatment plan as soon as possible. The most important innovation used in arthroscopic surgery is the arthroscope. The word arthroscope, which comes from the Greek language, and is translated to mean “view joint”, is a small, fiber-optic device that has a camera lens and a light attached at the end. The arthroscope acts as the eyes of the surgeon, and the image from the camera is displayed on a video monitor inside of the operating room that the surgeon uses while performing surgery. Without this little tool, minimally invasive surgery would not be possible as we know it. In order to get the arthroscope into the shoulder joint, a small incision is made into the area around the joint. The patient is under general anesthesia and asleep during the procedure. The arthroscope is inserted into that incision, or portal, and it provides the doctor with video images of the inside of the shoulder joint. Another incision, or two, is made so that other small surgical instruments can also access the inside of the shoulder joint and perform the necessary repairs to damaged tissue. One of the major benefits to arthroscopic surgery is that it can be performed on many joints in the human body. The most common joints, however, are the knee, shoulder, elbow, wrist, ankle, and hip. These quicker recovery times benefit athletes and athletically active people greatly. The smaller recovery times and fewer complications result in less time lost doing the things that they love to do. When faced with the option of open surgery and arthroscopic surgery, the minimally invasive option should be the best choice, in terms of orthopedic medicine, if at all possible. Find out more about rehabilitation. Kandil, M.D. is a board-certified orthopedic surgeon with fellowship training in sports medicine and arthroscopic surgery. He received his Doctor of Medicine from the Loyola University Chicago Stritch School of Medicine, and completed his fellowship at University of California, San Diego for Sports Medicine and Arthroscopic Surgery. Dr. Kandil is a leader in his field in the surgical treatment of shoulder conditions, like rotator cuff repairs, and knee conditions, as well as arthroscopic surgical techniques. 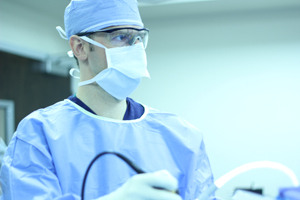 He is highly qualified as an arthroscopic shoulder surgeon. To find out more, contact him at 310.736.2793 to speak with an experienced orthopedic surgeon. Next, learn about minimally-invasive arthroscopic knee surgeries.